There are very few women in the entertainment industry (relatively speaking) who garner the respect and admiration of everyone the world over. One such woman, however, was Audrey Hepburn. This is my gift to you so you can start thinking about this extraordinary woman, and seeing what attributes you share with her, because mes amies, I know that you probably share many. Please respect that this is for personal use only … however please feel free to share this link with others so that they may join us as we learn from women, past and present, throughout the year who created lives of beauty. Who were able to see what true beauty was and who exemplified it in their deeds and actions. 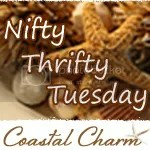 I have to thank Karen at www.thegraphicsfairy.com for sharing the lovely pink background that I used for this graphic. 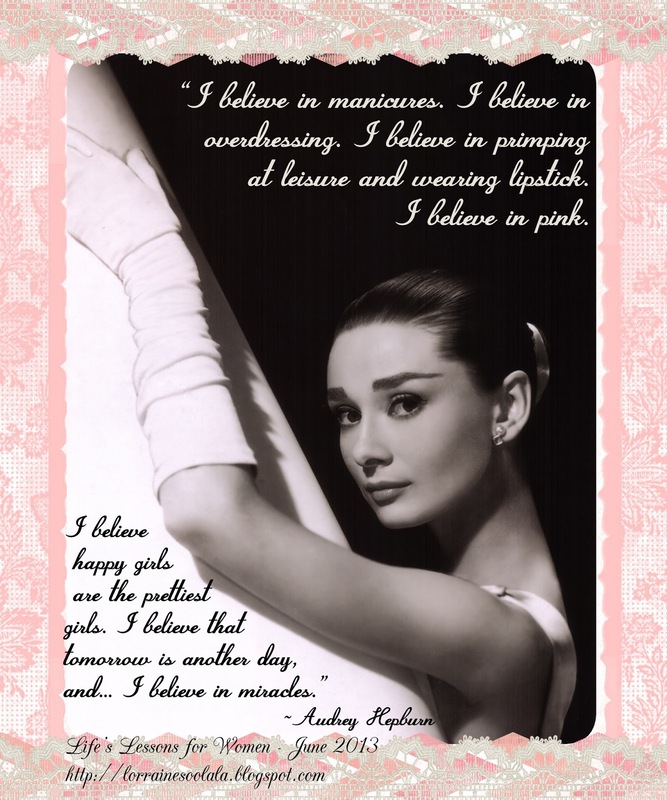 However, the quote is pure Audrey. I adore this picture, taken when Sabrina (the original movie) began its marketing. So … look forward to a month of goodies, wisdom, paper craft tutorials, laughter, maybe a few introspections as well … while we learn from one of the most gracious women who was a style icon as well as an advocate for the beauty and strength of women! 1) I could foresee myself wearing 5 years from now (unless a miracle happened and I lost weight … and then, Quelle Horreur!!! I’d have to go shopping again!!). 2) They were good quality clothing. They would actually last 5 years. With that being said, I refuse to not get a bargain, so this didn’t mean that I’ve spent all my money on clothing either. More about that later … I have some great tips for you clothes horses, but that’s another day. 3) They were truly “me.” They accented my body type to its best advantage and they were colors that looked best on me. 4) They passed the “Do I LOVE it, not “just like it” test. So … if you’re like me, you probably didn’t finish the challenge I gave you over the weekend. That’s okay. I still have drawers I haven’t gone through. So, let’s keep going, shall we? Only, now, let’s add the four (4) new challenges I’ve just given you to the mix. If you did try my challenge and looked for comfort and elegance (you can even change that out to excellence if you can’t perceive yourself as elegant yet, but we’re going to work on that, I promise! ), then I congratulate you, and I also hope that you’ll share your experiences. Please, when you can, share your triumphs, challenges, and stories. We can all learn from and help each other! In the meantime, I’m giving you another Coco’s Pearl. It’s a graphic I created for the Graphic’s Fairy’s Brag Monday party that I always take part in. I used her “freely given” label at the bottom of the graphic to highlight Coco’s pearl. I hope that you’ll really take her wisdom to heart. Let’s go forth and create our lives!! Bonjour mes amies, and have a wonderful week!!! P.S. As always, please feel free to click on the picture and then right-click to save to your computer. No mass production, please. However, please feel free to share via Facebook, Twitter, or Google Plus so that others can get their own copy and join us in our quest. Well, mes amies, it’s taken me a little longer than I had hoped but I am confident that you’ll feel it was as worth it as I do. I’m so excited to announce our new journey to feeling beautiful by learning from successful women who have already forged the path ahead of us. 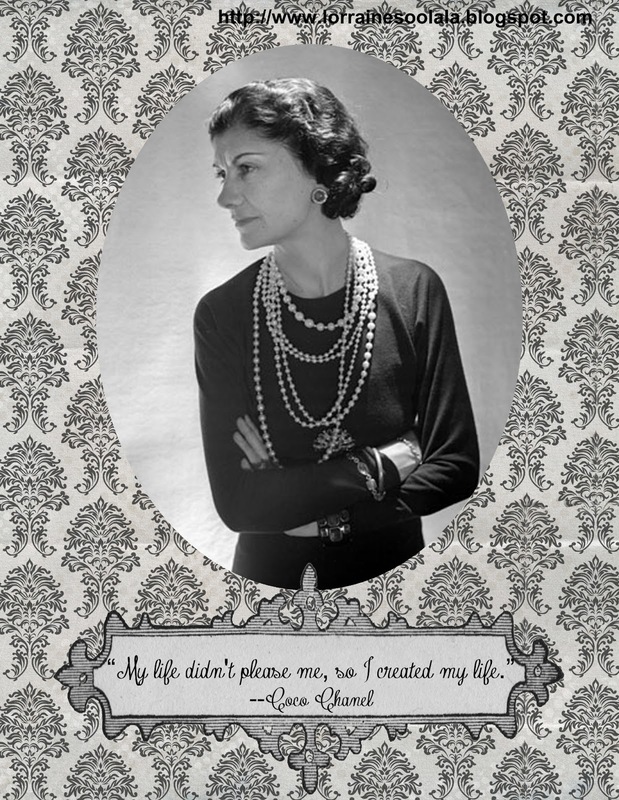 And, as my loves of vintage fashion and all things french are so strong, I had to start of with Gabrielle “Coco” Chanel, herself. What an amazing woman. What a path she blazed at a time when women had very few rights and very few comforts … especially in the way of dressing. I don’t know about you, but the thought of being trussed up like a Christmas turkey every day in order to wear my clothes, and then to try to get in and out of my vehicle with said clothes, while still breathing, is absolutely mind-boggling. I created the above graphic to get us started. Please feel free to download and print it out or save to your computer as a wallpaper. Many thanks to Karen at the Graphics Fairy for the beautiful french frame that I used in the background. I know you all have a very busy life, so today’s post will just be an introduction. But, if you do have time, please following this link HERE to a great, but not long, bio of her. It’s in written or video form, and really quite lovely! 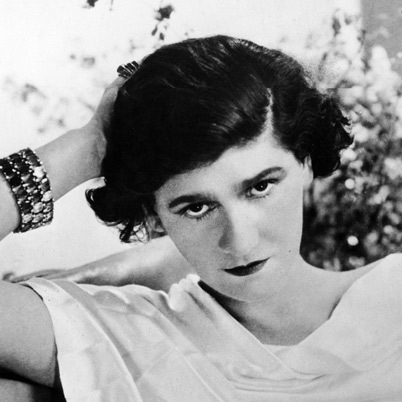 What is even more amazing about this woman, is that she was born in 1883 and lived until 1971, yet she still inspires fashion to this very day. Over the course of this next month, I’ll be sharing little snippets of what made this woman so memorable. And, I hope it will inspire you to believe and know that you are memorable. You carry within you, all that she had. We’re going to learn from her success, her mistakes, and her witty words of wisdom. It’s going to Coco Heaven!! So hop on board, girls … let’s take this crazy ride!! Before I close … I have what I’ve been asked for, and promised, for quite some time to share with you … a TUTORIAL!!!!! I know many of you think that you are not crafty. Many women think that you either have “it” whatever “it” is, that can magically make you creative, or you don’t. Well, I don’t believe that for a minute. 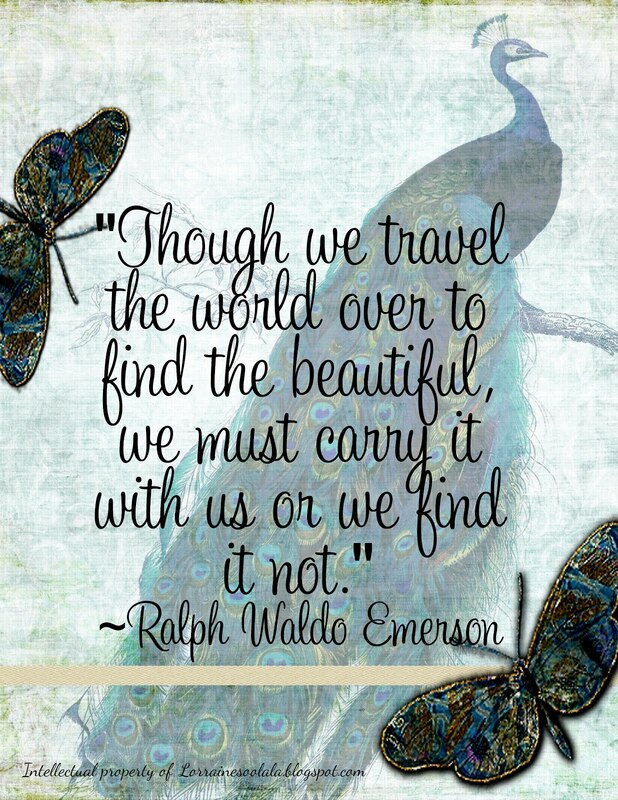 I have found the most wonderful crafter who has hopped on board and will be taking this trip with us … all the way. Her name is Tevis, and she will be offering 2 tutorials every month. For those of you who are intimidated by crafts, there is Paper Crafting 101, which will be offered the first (1) week of every month. For those of you who are crafty, but want to learn something new, different, and maybe a little challenging, we will be offering Paper Crafting 2.0 (offered the 3rd week of every month). Each month the craft will correspond with the icon from whom we will be learning from. So, this month’s craft is inspired by Coco. This picture was taken when she was younger, but if you notice the bracelet she has on … it could be just as popular today. So, you can click HERE to go to our tutorial page and meet Tevis. Or, you can click on the Paper Crafting 101 button. Also, be sure and join either my facebook page, or my twitter as I will be sharing little bits of wisdom over the next month regarding Coco. If you’re not a huge Facebook fan, but love Twitter, that’s the way to go. If you don’t tweet, but like to check in on Facebook, then that’s best. Of course, you can join all of my buttons and just have a complete Chanel fest if you’d like. Anyway you want to … come join us as we learn from one of the top 30 women listed as Women Who Changed the World!! 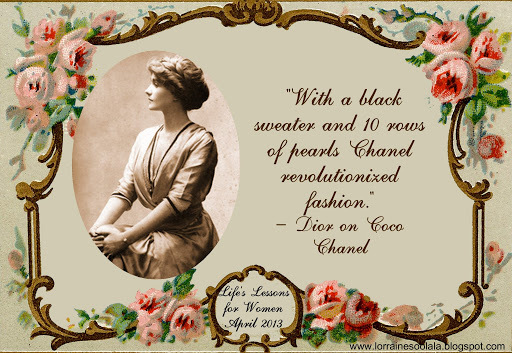 Bonjour Mes Amies … I hope you enjoy draping yourselves with Coco’s pearls this month. Well, mes amies … it has been absolutely too long. I have missed you dearly, and am so grateful to be able to get back in the saddle and blog again. I have so much news to share, but will do so over the next few days. One thing I know is that none of us have a lot of time, what with life being so fast-paced. So, sit back, put your feet up for a few seconds, and I’ll share some juicy news. First of all, I hope your winter has not been too harsh for you. I’ve thought of many of you who went through the blizzard out east and hope you are well. Secondly, I have to tell you that there are many changes coming for the life, tone, and feel of my blog. I’m so excited about this year and the direction I will be taking. Thank you, again, for taking this ride with me. But, before I forget … I need to share my Valentine with you. It’s a Valentine I created using some of the Graphics Fairy’s images. I hope that you enjoy it and that you have a wonderful Valentine’s Day. Even if you may not have a “Mr. Darcy” in your life … I hope you’ll take the time to think of all of those who are important in your life and who you love. I love Valentine’s Day. I have my Mr. Darcy, so that makes it special … but I also have a lot of other people who are special in my life and I love to think of them and what a joy they are to me as well. So, without further ado … please accept my Valentine. You may click on it, right-click, and save to your computer for personal use only. Of course, please feel free to send anyone to my blog to get their own Valentine!! And now … I’m off to Washington D.C. I have had the honor of being selected as Google’s GYBO (Get Your Business Online) Ambassador for the state of Indiana. And so all 50 state representatives were invited to attend a summit in Washington D.C. I promise, I’ll take pictures, and I’ll update you as soon as I get back about all of the details!! Bonjour Mes Amies … it’s so good to be back! And Now … On to Christmas!! After listening to Christmas music and looking at Christmas products since before Halloween … I am now officially embracing the Holiday season! * Have I bought all of my presents? No, but some of them. * Do I want to do it all now? YES!! * Decorate til the cows come home – my favorite part of Christmas. * Buy my “Christmas Vacation” sized Christmas tree (has to be real or it’s not Christmas) my husband so graciously puts up with every year. * Stress over all of my last minute orders in my shops. * Stress over the perfect holiday menu and then cook until I can hardly stand, barely eating the food because I’m not hungry over smelling the food all day. Did I say the word STRESS enough? Sounds like fun, huh?! LOL! Seriously, I love the holiday season. I love finding just the perfect gifts for people, and then going all OCD over the wrapping of the gifts. I love decorating my tree so that it’s beautiful enough to be on the front of BHG magazine. I love the smells of spices in the air. I love the generosity of people, and the goodwill that you just don’t see at other times of the year. I may even like my neighbor (who is a very crabby man, and very hard to like … but you never know!). 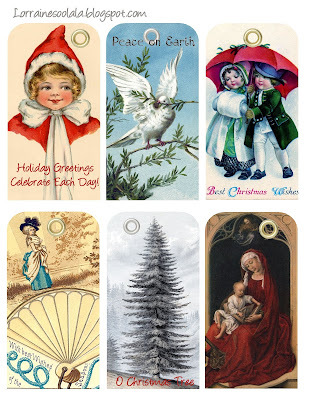 So, in the spirit of Christmas, my Brag Monday entry for the Graphics Fairy are more Christmas gift tags. Hopefully you have taken advantage of some of the sales going on and you have presents that they will work perfectly for! Bonjour mes amies, and have a wonderful week! Mine will be filled with last minute wedding preparations, and the excitement of seeing family members I haven’t seen in over a year. *As always, these are for personal use only. Please feel free to click on the picture and right-click to save to your own computer. You may, of course, send anyone my way to download their own copy! 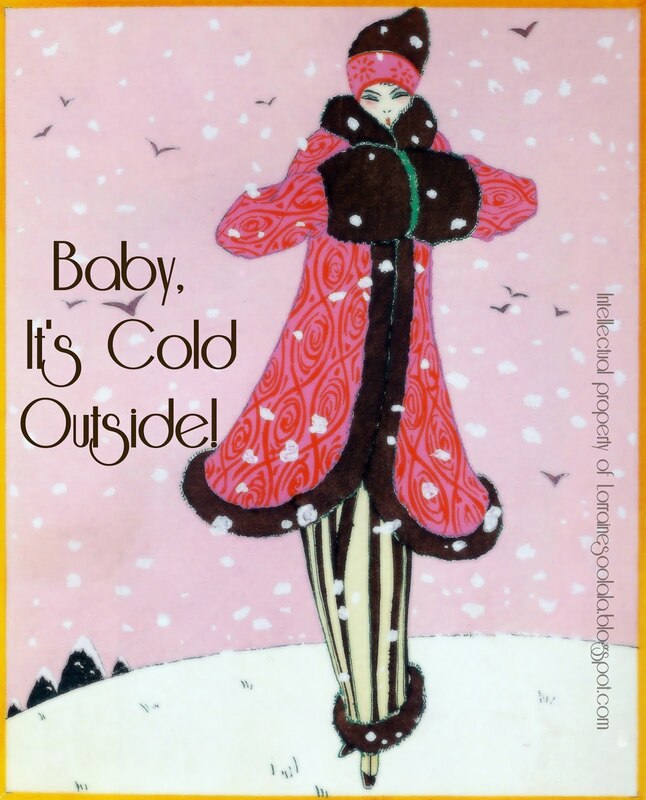 Baby, It’s Cold Outside – or it should be! This past few weeks I’ve had a hard time staying healthy. The weather keeps dipping up and down, up and down, which is not a great combination with asthma or staying healthy! But, I’m now feeling much better and trying to get back on the horse. 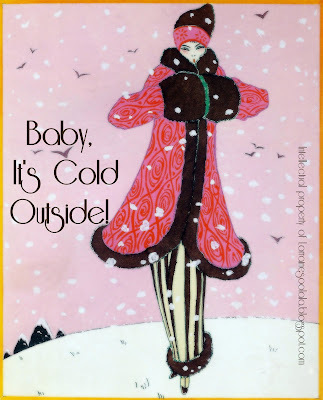 In the meantime, I’ve been gathering Christmas graphics, Art Deco graphics, and a whole bunch of fashion illustrations that I’m so excited to start using. And, so I had to make a Printable for you. I hope you enjoy it. It’s something that I will be using in my stores (Zazzle and Etsy), but in the meantime, I’m happy to let you use it to inspire you. Isn’t she wonderful?! She’s from 1913 from a french fashion magazine called La Gazette Bon Ton (High Society Fashion Magazine). This is truly the beginning of the Art Deco movement and you can tell by the modern lines and drape of the fashion. And it’s PINK!! Who could ask for more!! So, now on to my Brag Monday. 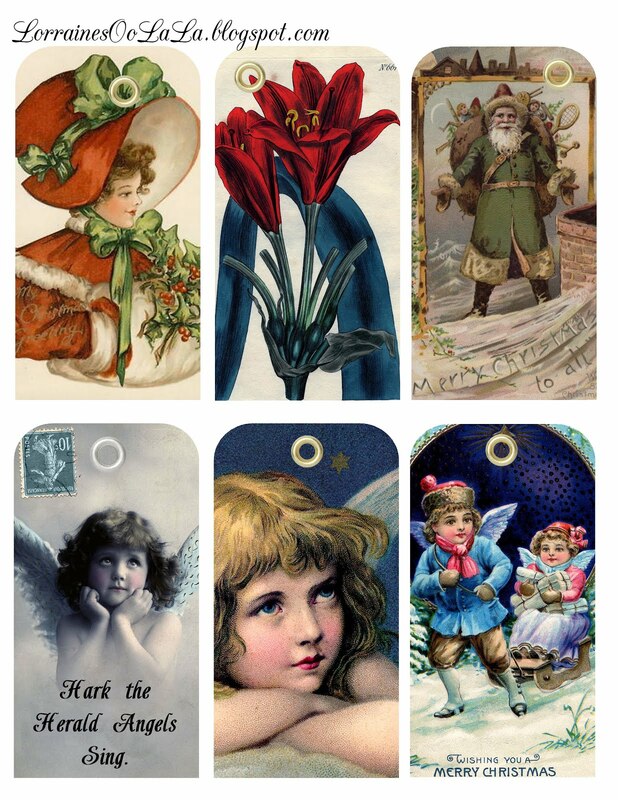 I also have been working on Christmas tags with some of the beautiful Victorian pictures I found. Many thanks to the Graphics Fairy for sharing her beautiful images. So, once again, these are for you to start using as you (hopefully) are getting ready for Christmas. I hope you enjoy these as much as I enjoyed making them. Bien Sur, I had to include one with Marie Antoinette. It was created from an old Victorian Christmas card in the shape of a fan. It wasn’t easy, but I was able to keep the wording just as it was on the original card. As always, these are for personal use only. You may not mass produce, but please feel free to send anyone my way to download their own copy. 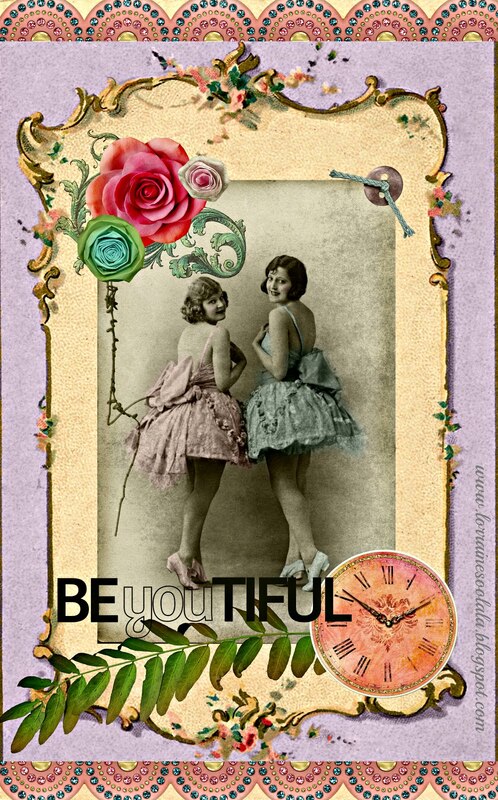 Have a wonderful week mes amies … don’t forget to enjoy the holiday with style, beauty, and grace … and if so inspired by Marie … overindulgence!! I believe I may have mentioned earlier that I have been really working hard on finishing up some projects in my home. It is truly coming together, and I’m so excited about how I feel when I open my door, walk into my home, and just feel … aaaahhhhhh … I’m truly home. Not only is this transformation the result of trying to create a beautiful home, but it is also an internal transformation … a realization of who I am and what makes me happy — what “speaks” to my soul. I’m in my late 40’s and it has taken some time for me to figure out what truly is me, what truly makes me happy, what truly speaks to my soul. There have been several times in my life when I thought I had figured it out. However, what “spoke” to me at 20, isn’t what speaks to me at 48. Too much life has happened in the meantime. I’m reminded of the analogy of us starting out as lumps of coal, and through life, God creates a diamond … something that He saw in us from the very beginning, but that we aren’t able to see in ourselves. At least for many, it takes a long time, for others, they never see their full glorious worth. How incredibly sad that is. So, today, for my Brag Monday, I’ve created a free printable to help remind us that we have to carry the beauty within to see the beauty outwardly. I particularly hope that it will inspire you to remember how beautiful you are … and that you will believe it! I love this quote by Ralph Waldo Emerson. I created the printable using a peacock graphic (with many thanks) by the Graphics Fairy. As always, feel free to click on the printable and right-click to save to your computer. It is for personal use and you may not mass-produce or use in any commercial way. Please feel free to send people my way so that they may download their own copy. Au Revoir mes amies … have a wonderful week! !